We wanted to take a moment to give you an update on the earthquake in Nepal. The situation continues to be dire. You may have heard that just today there was another magnitude 7.3 earthquake centered near Mt. Everest. Many of the small and remote villages that have been so badly hit by the earthquake are only now being contacted by rescue and aid efforts. Food and water continue to be scarce, and there is a tremendous shortage of the materials and manpower needed to provide shelter and care for those effected. We can take some comfort in knowing that Mingyur Rinpoche was not harmed by the first earthquake, and that the monks at Ösel Ling are now safe, as is Tsoknyi Rinpoche and his family, along with the nuns and monks at his monastery, Tsoknyi Gechak Ling. We’ll let you know if we hear anything at all from Mingyur Rinpoche. Our thoughts and prayers are with the people of Nepal and other areas affected by the devastating earthquake on Saturday, April 25. Some of you may know that Nepal is the home to Tergar Ösel Ling Monastery, one of three monastic centers that operates under the guidance of Yongey Mingyur Rinpoche. We wanted to let you know that we have heard from the monks at Tergar Ösel Ling and although there is significant damage to the buildings, no one was seriously injured and all of Mingyur Rinpoche’s immediate family is unharmed. As Mingyur Rinpoche himself is on a wandering retreat, we don’t have any information about him at this time. We do not even know whether or not he is in Nepal. Please be assured that if we receive any information we will pass it on. We think that the priority at this point is to help the thousands of people in Nepal who have suffered so much loss and who are struggling at this very moment to find the basic necessities to survive. If you wish to contribute, here is a list of vetted charities doing relief work for those affected by the earthquake. We plan to raise funds to help support the monks and repair the buildings at Tergar Ösel Ling Monastery, via the Yongey Foundation. More details will follow soon. Meanwhile we suggest that you undertake whatever meditation practices help nurture your compassionate response to the immense suffering of this situation and dedicate any benefits to the welfare of those who have been affected by this tragic event. You may also wish to include a long life prayer for Mingyur Rinpoche. April 29th, 2015: We received a letter from Khenpo Gyurmé, the head of Mingyur Rinpoche's monastic college, Ösel Ling, in Kathmandu, Nepal. Please read his letter below and, if you are able, help support the activities of Tergar Foundation Nepal to provide for the monks and nuns, their families and the neighbors of the monastery. 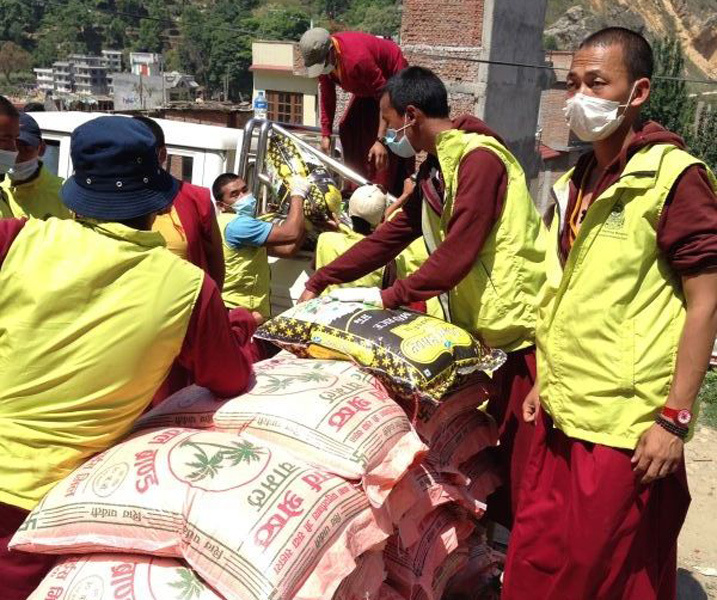 As you may have heard a very large earthquake has struck Nepal devastating the Himalayan region including our monastery. We are very grateful that Mingyur Rinpoche's mother, grandfather, and the monks and nuns are not injured and that they are able to perform pujas and recite prayers for those who have died. We are still experiencing aftershocks from the earthquake that require all of us to live outdoors in tents. At this time it is raining heavily and there are landslides. It is difficult to obtain water and food to cook outdoors and to find other necessary supplies. We are also very concerned for the family members of our monks and nuns, and our neighbors, who have lost relatives, been seriously injured or had their homes destroyed. Fortunately many buildings at the monastery; the guesthouses, the classrooms, the living quarters, and other structures such as the wall of the monastery, were not completely destroyed. They are heavily cracked and will require repair. Unfortunately our main Temple, originally built by Tulku Urgyen Rinpoche, Mingyur Rinpoche's father, will have to be torn down and rebuilt. We ask that you continue your prayers for us and that you also consider a donation at this critical time to help us provide assistance to our neighbors, our monks and nuns, as well as their families and eventually repair our monastery. Thank you in advance for your support and generosity. It is much needed and appreciated at this time. If you have any questions please contact Lama Trinley (+1 602 810-3392) or Tim Olmsted (+1 970 846-2699). 1 responses on "Updated: Pray for Nepal 2015"
Yes have been and continue to pray for Nepal and of course our beloved teacher. Was so please to find out from your website that his monastery in Nepal is not too badly damaged and his family are safe – also the websites for donations. I know we are all longing to hear about Mingyur Rinpoche – that he is alive and safe. New Zealand has always had a close connection with Nepal and I loved Nepal and the Nepalese people and the Tibetan people there, when I went there many years ago. I know you will keep us up to date.